There are many theories behind the suicidal nature of human beings and among those one of the most popular and well accepted is of American psychiatrist Karl Menninger’s theory , where he has explained three mental stages: the wish to be killed (guilt), the wish to kill (revenge), and the wish to die (hopelessness). Srijit Mukherji deals with the “wish to die” or the hopelessness syndrome in “Hemlock Society,” in an analytical style and ends up with a masterpiece, which portrays the emotional quotients of human and questions the impact of modern - urban lifestyle on our mind aligning with the Surrealist theory of Andre Breton (Black comedy). Meghna (Koel Mallick) is tired with life. She has been ditched by her fourteen year long relationship with her fiancée. She doesn’t enjoy the company of her step-mother and misses her deceased mother and her childhood days. The days which are lost in the midst of the din and bustle of the city life. She thinks her father doesn’t love her any more. She cannot concentrate on work and is on the verge of losing her job. Sshe wants to quit- she wants to commit suicide. And in the midst of this turmoil, director Srijit Mukherji brings in Ananda Kar (Parambrata Chatterjee) in Meghna’s life. With time, Meghna learns that Ananda runs a club, “Hemlock Society” that teaches the easiest ways to commit suicide to those who want to put an end to their lives. And the narrative revolves around the thought of glorifying the importance of life in this beautiful world, on the back drop of Ananda’s creation of defining different ways to die (suicide) to the mentally and emotionally broke persons. Parambrata is vibrant and just brilliant as Ananda. Director Srijit Mukherji exploits his acting skills with a smart script and powerful dialogues that adhere to the narrative. Koel’s character has gone through many shades and she is just outstanding throughout the movie. The film has a powerful supporting acting team comprising of Soumitra Chatterjee, Sabitri Chatterjee, Bratya Basu, Deepankar De, Roopa Ganguly,and Sabyasachi Chakrabarty and all of them perform brilliantly in their respective characters. Silajit Majumdar as Siddhartha Roy is vibrant and convincing. But I thought the discussion of “TDS” among the faculties of the club with Ananda is an excess in the movie and that could have been handled in a different manner. The movie has few beautiful songs composed by Anupam Roy, including “Amar Mawte” (Lopamudra Mitra), “Jawl Phoring” (Silajit Majumdar) and “Ekhon Onek Raat” (Anupam Roy). Cinematography of Soumik Halder is classy and refreshing, and blends perfectly with the slick and smart editing of Bodhaditya Banerjee and Saikat Sengupta. The name Ananda has been derived from Hrishilesh Mukherjee’s cult Hindi movie “Anand”, and director Srjit Mukherji has highlighted it many times, as Ananda Kar utters the word “Babumoshai” repeatedly in the movie. 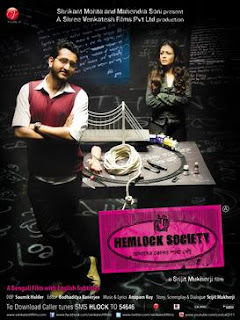 “Hemlock Society “was Srijit’s third venture and released in 2012 and for me it’s the best Bengali movie of his till date. He deals with the sublime urban emotions comprehensively and creates a beautiful love story out of the disgust and frustration of the urban life. The brilliance of the director is crafted in every frame of the movie, with a stylish and smart storytelling approach that adheres to reality. The movie has few striking scenes and one of those is when Ananda tells Meghna that he is suffering from Lymphocytopenia and he might not survive for more than two years, as the camera focuses on Meghna’s lips and suddenly her expression changes from joy to sadness. It highlights the motto of the narrative that defines joy and sadness as just two sides of the coin called life and the need to accept it, to live with the beauty of this creation of the creator. As a movie, “Hemlock Society” raises many questions which are enough to stimulate the thought process of sensitive audience. A must watch.